Drinking and driving don’t mix, but Absolut vodka and NASCAR now have something in common. The two companies were honored, along with Nike, as winners of the Excellence in Marketing awards at a CMO Summit held at Wharton on Sept. 19-20. Representatives of the three companies made presentations describing their award-winning campaigns to an audience of chief marketing officers. The conference was sponsored by Wharton, McKinsey & Co. and the Marketing Science Institute. The following article summarizes the three campaigns and describes how the companies’ brands benefited from them. Facing that challenge, Absolut sought to position itself as “a smart, stylish, contemporary, creative, unexpected, witty brand of superior quality.” The Absolut tagline reinforced the name until it did sound like a brand. None of the ads was subjected to a focus group or other research before it ran, according to Lewis. Yet they have become such a part of pop culture that Lewis’s 1996 book on the campaign, Absolut Book: The Absolut Vodka Advertising Story, sold 300,000 copies. Lewis describes such behind-the-scenes schemes as using wheat to attract pigeons in Piazza San Marco to form the shape of a bottle of Absolut Venice. The campaign’s creativity has earned it free publicity as well. A magazine insert that was a working snow globe became the subject of dozens of news stories one December. When Absolut packaged 500,000 ties with its Father’s Day ad in the New York Times, Regis Philbin wore one of them on his talk show the next day. While the U.S. market for vodka has declined, to 36 million cases in 2000, Absolut’s share has risen dramatically to 4.5 million cases, more than half of all the imported brands. In Advertising Age’s listing of the top 10 ad campaigns of the 20th Century, Absolut’s was the only one that did not use television. Founded in 1972, Nike’s fortunes rose dramatically after it signed an endorsement deal in 1985 with a skinny basketball player from the University of North Carolina named Michael Jordan. But Nike officials recognized several years ago that to become a global brand they had to go after the world’s most popular sport: soccer, or as it is known outside the U.S., football. “In Europe and Latin America and Asia, if you’re not about football, you don’t count,” said Trevor Edwards, Nike’s vice president for U.S. brand marketing. To reach the young players, Nike signed endorsement deals with stars from Argentina, Great Britain, Portugal, Mexico, China and Japan. They also looked for players who were expressive and embodied a fast, attacking brand of soccer — in contrast to the methodical, defensive style called German football. An early coup was the signing of Brazil’s Ronaldo, who helped Nike design the Mercurial Vapor shoe. “Athletes are like an R&D investment,” Edwards said. In March 2002, Nike began an estimated $100 million worldwide marketing campaign built around what it called the “Secret Tournament.” The ‘tease’ phase of the campaign began in March with ads featuring little more than a pair of soccer cleats and a scorpion – a symbol of “the quick and deadly style of play” with which Nike wanted to be identified. For the curious, there was a reference to nikefootball.com, where visitors could play video games and learn — in 12 languages — more about the tournament. The tournament’s ‘Excite’ phase began in April, with a series of dark, edgy commercials evoking the post-Apocalyptic Australia of the movie Mad Max and the alienation of Fight Club. Eight three-man teams of professional soccer stars are seen playing a round robin series of sudden-death games in a small indoor field encased in a steel cage. The “Involve” phase of the campaign was launched in June, when Nike opened parks in Mexico City, Tokyo, Rome and 10 other cities to host tournaments for young players. Nearly two million players participated. By the time of the 2002 World Cup this summer, Nike had made its presence felt in the soccer world. Eight of the 32 finalists wore Nike uniforms, including Brazil, which won the Cup for a record fifth time. In the final game, Ronaldo scored two goals wearing a pair of chrome Mercurial Vapors. According to Edwards, “unaided awareness” of Nike as a football brand has now surpassed that of Adidas. Nike’s global football revenues totaled $500 million for the fiscal year ending May 31, a 24% increase over the year before. Its football revenues in Asia rose by 68%. Thanks in part to the success of the campaign, Nike expects its international revenues to exceed U.S. sales for the first time in fiscal 2003. Like Absolut, Nike’s campaign also had its impact on pop culture. “A Little Less Conversation, a Little More Action” — a remixed Elvis Presley song that Nike used as the soundtrack for its ads — became the number one hit in 13 countries. 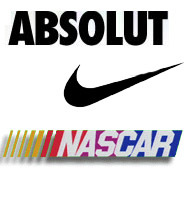 NASCAR’s increasing popularity is a more recent phenomenon than that of Absolut or Nike. A family-owned company founded in 1948, the National Association for Stock Car Auto Racing has grown from a Southern dirt-track circuit with blue-collar roots to a mainstream sport with races at 125 tracks in 39 states. Three years ago, NASCAR had no marketing department and its races were confined mostly to cable television. Now it employs 200 people in marketing and is in the second year of a six-year $2.4 billion TV contract with Fox, NBC and Turner Broadcasting. Seventeen of the top 20 live sporting events in 2001 were NASCAR races. It is the number two sport in television viewership, behind only the NFL, and number three sport in licensed sales, with $1.34 billion in revenues in 2001. Sporting News, which never covered NASCAR before, did six cover stories on the sport this year. According to a brand study conducted for NASCAR by market research firm Ipsos-Reid, NASCAR has 75 million fans, 42% of whom earn at least $50,000. Some 40% of the fans are women and nearly 60% are between ages 18 and 44. The networks reportedly lost more than $100 million last year on the deal, which is expected to net NASCAR, its teams and tracks four times the revenue of prior deals. But boosted by Fox’s promotions during the Super Bowl and NBC’s spots during the NBA playoffs and Winter Olympics, ratings have surged in 2002. Twenty-five Winston Cup races will be broadcast on national TV this year, up from 10 in 2001. “NASCAR is the great sales story of this season,” Jon Nesvig, president of sales at Fox Broadcast Co., told Brandweek, a trade publication, in April. “So far this year, all the races that aired were sold out, and at higher rates than last year.” Fox’s Speed Channel features NASCAR programming daily. In June, NASCAR debuted an interactive pay-per-view service that allows viewers on some digital cable systems to toggle between the live network feed, several channels dedicated to in-car cameras, and a channel providing race data. The new offerings will appeal to NASCAR’s 40 million ‘hard-core’ fans, who spend an average of $700 annually on NASCAR merchandise and nearly nine hours per week watching races, visiting NASCAR websites or reading about the sport in magazines. For them, said Brett Yormark, NASCAR’s vice president of corporate marketing, “it’s not just a sport, it’s a lifestyle.” According to Yormark, NASCAR fans like the fact that no team or driver dominates the sport. Last year’s Winston Cup Series produced a record 19 different winners, including five first-timers. Each race typically produces 15 to 30 lead changes. NASCAR claims to have the highest return on investment of any sports sponsorship and a 97% sponsor renewal rate. A 1999 survey conducted for SportsBusiness Journal ranked NASCAR ahead of all other sports properties in service to sponsors. More than 62% of the sponsors responding said NASCAR was “client-centered and service-oriented,” well above the ratings given to the major team sports. Only 34% of sponsors gave positive marks to Championship Auto Racing Teams (CART) and Indy Racing League (IRL), the open-wheel auto racing leagues. A primary sponsorship on a major team reportedly ranges from $5-$7 million. An associate sponsorship, entitling a company to have its logo on a car’s quarter panel, costs a reported $25,000-$100,000. “Our goal is to turn that expense into an asset,” said Yormark. Academic studies on a variety of sports and non-sport venues have provided little evidence to back the efficacy of sponsorships. But a study published last year in the Journal of Current Issues & Research in Advertising appears to support NASCAR’s value proposition. The study, by Aron M. Levin, Chris Joiner and Gary Cameron, found that the most involved NASCAR fans were twice as likely to recall brands that were featured on cars as those featured only in ads during a race. Brands that were featured on cars and in ads during the race were three times as likely to be recalled as brands featured only in ads. In addition, the researchers found that on-car displays significantly increased these active fans’ favorable attitudes toward the sponsoring brands.